I’m pretty sad that one of my favorite dramas of the year has ended. I never thought that I would be fall in love with Fight My Way. Though, my love for this one is not as intense as my love for Reply series, I will gladly put this show in a special rack within my mind and – maybe – re-watch it again when I have a bad day or start questioning my purpose of living. So, without further ado, let’s go right away to the review! 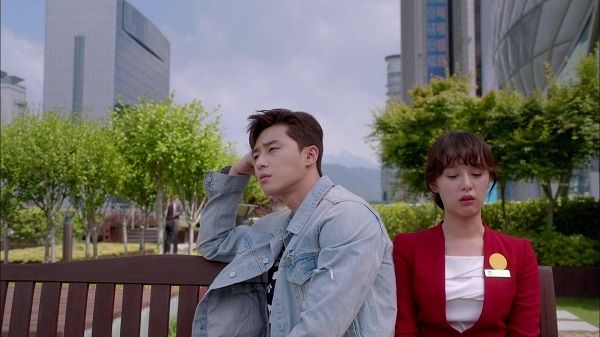 Fight My Way depicts a story of four adults who are struggling in life. Choi Ae Ra (Kim Ji Won) who dreams of becoming an announcer ends up working in a department store. 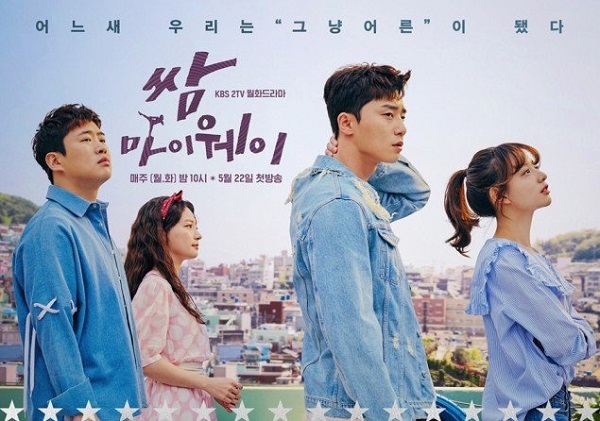 Ko Dong Man (Park Seo Joon) who once known as talented Taekwondo athlete now ends up working as insect exterminator. Baek Seol Hee (Song Ha Yoon) and Kim Joo Man (Ahn Jae Hong) have been dating for six years and are hiding their relationship from their colleagues at work because they are working in the same company. Their relationship seems to look fine until one of Joo Man’s junior (evil b**ch) starts to develop a feeling for him. 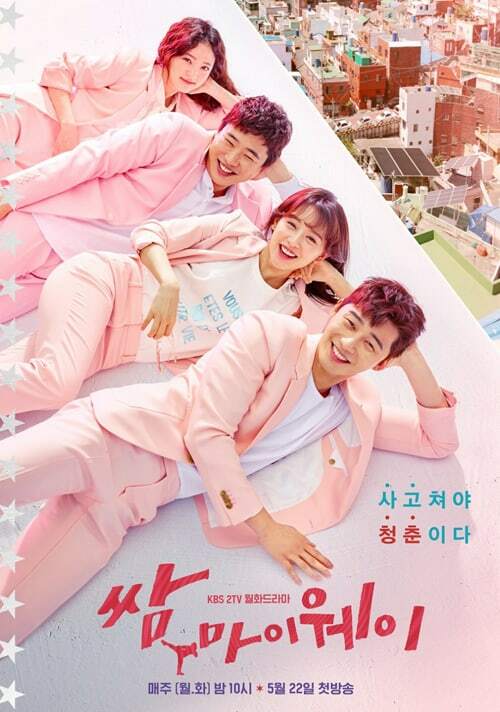 Oh, did I mention that four of them – Ae Ra, Dong Man, Seol Hee, and Joo Man – are long-time best friend and living in the same neighborhood area? This self-acclaimed “Fantastic Four” invites you to witness how they live their life, fighting against never-ending problems, and trying to reach their dreams on their way. There are more pros than cons of this drama for me. I’m enjoying my time watching this show. The strongest point of this drama – for me – is probably the beautiful friendship between the four main casts. Their friendship is so beautiful; it makes me want to go back in time and built a friendship as wonderful as what the Fantastic Four has. The type of friendship these guys are having is my favorite type of friendship. The kind of friendship I love. 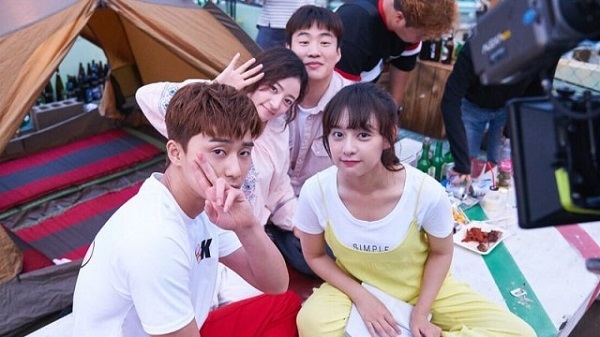 Watching the Fantasic Four’s friendly relationship is like watching Ssangmundong Alley’s Gang in Reply 1988 or Shinchon Boarding House’s Squad in Reply 1994. It also feels like watching the Central Park’s Crew from Friends (American TV Show). I love how Ae Ra said that she will always be there for Seol Hee even though Seol Hee decided to leave Joo Man and leave her job. I love how Dong Man said that he can’t side with Joo Man after he broke up with Seol Hee but said he will root for him to get back together with Seol Hee because there’s no other guy who will be as good as Joo Man for Seol Hee. I love how Ae Ra and Dong Man decided to not overly involve in Seol Hee and Joo Man’s relationship and vice versa. Other points I love from Fight My Way is its characters. I love how relatable and flawed the main characters are. They are portrayed as adult who are living a tough life and they are shown as adult who really are living a harsh life. I like how the wardrobe team “dolled” them up. I used to see supposed-to-be-poor drama character wear expensive clothes and accessories. But it aint happened in Fight My Way. Take Ae Ra for example. She always wears her father’s restaurant T-shirt and track pant in home instead of using some fancy pajamas. And when she’s out and about, she wears something simple and cheap-looking. Seol Hee, on the other hand, always using her company’s uniform and I’ve seen her wearing the pink dress Joo Man bought for her for several times during the show. The wardrobe selection is perfectly portraying the characters’ financial status. Other thumbs-up point of this show is the portrayal of Seol Hee and Joo Man’s relationship. Thank you casting team for choosing Ahn Jae Hong to play Joo Man. Seol Hee and Joo Man couple looks far from a fairy tale couple, a couple I often see in dramas, a couple that usually consist of an amazingly beautiful woman and incredibly handsome man. Seol Hee and Joo Man looks like an ordinary, everyday couple. A couple we often see in real life. I love how the casting team decided to go with Ahn Jae Hong, instead of other actors. I’m not saying that Ahn Jae Hong is not attractive. He’s attractive in his own way. He has that charm. In fact, I’m starting to like him more after watching this show. He looks manlier in this drama rather than his witty character in Reply 1988. Seol Hee and Joo Man will probably become one of my favorite couples, more than the Ae Ra-Dong Man couple. What is more? Oh, its depiction of how adult relationship should be. In terms of romance, the characters are always saying thing straight to the point – well except for Seol Hee. I love how they are dealing with their feelings and romantic relationship. The con of this drama for me is probably the ending of it. I don’t know, but it feels like the story is being rushed toward the ending. Yes, I get all of the answer. No questions left unanswered. But, I just have the “That’s it? That’s the ending?” kind of feeling. It feels incomplete for me. And that minor incompleteness is what leads me to give score of 9.5/10 for this show.